Fred is on tour for three years now !! In the past year, Fred has experienced much. He visited Hong Kong, travelled to Vietnam and on to California/USA. From there he took a flight to the eastcoast, was in Seattle, New York and Newark, passed the Panama-Canal to Los Angeles. From there he went back through the Panama-Canal to Cartagena, Caucedo, Tangier und Valencia. He experienced much, saw a lot of nice places, sent home nice pictures and reports. A lot of people took good care of him. 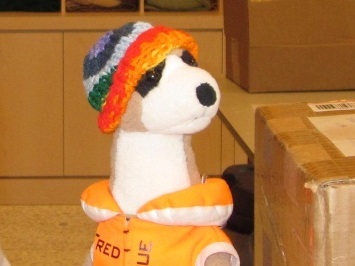 In New York for example, Fred was equipped with a hand knitted hat. Apparently a criminal street gang has taken from him this cool hat, because he did not bring it home. 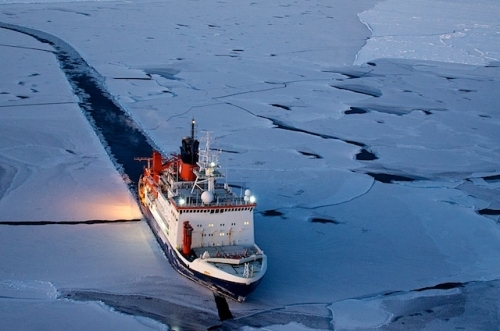 the "Polarstern". We could not resist to this idea and ordered Fred back home. Due to the excellent logistics of Laeisz, Fred arrived on time and safe in Hamburg. Fred even had time to go on a tour in Hamburg and also for a trip to the Flensburg Fjord. But Fred can also do good. As a young celebrity he is now Beach Guardian and inspiration for the lifesavers of DLRG Wedel and wants to draw attention to the great work of the DLRG. And the team of DLRG Wedel tailored him his own jacket. On 05. June 2013, Fred went on his flight to Cape Town/South Africa with Steffi to join the researchvessel "Polarstern". Fred now enjoys his adventures in the Antarctica. Fortunately he was fitted with suitable polar clothing. Because it is so cold. And everywhere is ice. Lots of ice. 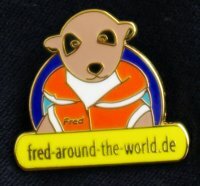 Due to his three year anniversary we are giving away Fred pins again. Congratulations to Fred and thanks to all Fred fans who follow his travels, sent emails and also for the entries in the guestbook. All you have to do: Surprise Fred. For example with a beautiful postcard, a photo, a photo montage, a poem, a drawing, a video, a song or send a copy of a donation receipt for example seamannsmission or whatever. The most beautiful, most original, funniest submissions will be rewarded with a Fred pin. Participants also agree that their submissions can be published here.